Every once in a while, 2000 AD serves up a new strip that manages to attain ‘classic’ status, despite the premise being fairly ordinary. On balance, perhaps it’s actually this ordinariness—with a typically 2000 AD twist applied, of course—that marks such a strip out for longevity, because it’s not trying too hard. A case in point is Kingdom, scripted by the usually reliable but rarely remarkable Dan Abnett. On the face of it, Kingdom is another future war story, following a battle against swarms of highly evolved insect-like creatures, referred to as ‘Them’. The twist is that the protagonist, Gene Hackman, is a tough bipedal dog-like creature wondering the Earth with his pack, getting guidance from unheard ‘urgings’ and discovering there’s more to his life and world than ‘scrapping’ and orders. On the page, the story comes across as an odd mix of Mad Max 3, the battle scenes from Starship Troopers, and Grant Morrison’s We3, with its mix of post-apocalyptic settings, stunted language, massive and bloody battles against overwhelming odds, and intelligent, genetically enhanced canines. However, the twists in Abnett’s tales, his deft characterisation and the assured changes in pace (from frantic battles to thoughtful contemplation of Gene’s aims and desires) give the strip an identity all its own. Abnett’s dialogue is a particular standout. Rather than aping the irritating broken English of the film world, he crafts a new language for his characters, simplifying the English tongue. Peppered with phrases known to dogs, the language comes across as a living, breathing thing (a particular standout being the phrase “your mouth is full of wrong”), and so, by extension, does the entire strip. Ably assisted by Richard Elson’s workmanlike art, with its direct storytelling, clean lines and strong panels, Kingdom is a joy, and deserves its place amongst the very best of 2000 AD’s titles. Kingdom: The Promised Land is available now for £11.99. For more information about 2000 AD graphic novels, check out the 2000 AD Books website. When Gene pissed on the carpet, no-one had the balls to smack him on the nose with a rolled-up newspaper. I don’t usually review single issues of comics, but with the Judge Dredd Megazine seemingly having its 50th or so revamp in its (almost) 18-year history (next month, it’ll be old enough to drink beer), I figured I’d make an exception. The Megazine now comes bagged—something I find a hateful proposition—and has had two quid added to its price tag, but bad feelings are tempered somewhat by the contents of said bag. First up, the Megazine itself, which is—for the time being—finally devoid of reprint. 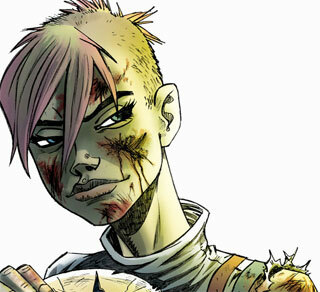 The most notable addition to the line-up is Tank Girl, by original scribe Alan Martin and relative newcomer Rufus Dayglo. This irreverent, punky tale feels right at home in a 2000 AD title: Martin’s fun, explosive script is a real blast, and Dayglo’s somewhat retro artwork evokes the best of classic 2000 AD art, while also channelling a little Jamie Hewlett. Elsewhere, playfulness is also evident in most of the Dreddworld strips. Female PSI Judge Anderson rummages around virtual realities, aided by an AI that resembles a levitating blue ape, while Tales from the Black Museum offers a wickedly dark take on the pressures of coming up with new fads—something exacerbated by the gnat-like attention spans of Mega-City One’s population. The issue’s sore thumb is, oddly, Judge Dredd, whose Wagner-scripted story, Ratfink, showcases a villain so downright nasty and an outlook so miserable (it’s set in the barren Cursed Earth desert, at night, in the pouring rain) that you can’t help feeling glad the other strips are there to cheer you up afterwards. That said, Dredd is the perfect antidote to too much ‘happy’, and proves that anthologies can pack punches from several directions, rather than banging the same old drum. Elsewhere, the closure of Extreme Edition, 2000 AD’s reprint title, means reprint has shifted to what’s touted as a ‘graphic novel’ bagged with the Megazine. In reality, this is a 64-page comic, styled to resemble Rebellion’s line of 2000 AD trades, but with noticeably thinner paper. The first collection compiles a selection of Jock-illustrated Dredd strips, offering a fascinating insight into the evolution of one of the best artists in the business. Some of the tales aren’t exactly inspired, but the collection is nonetheless engaging, and The Shirley Temple of Doom—a story about undercover Judges aiming to bring down a cityblock mafia—is a minor classic. Messing with formats is a dangerous business, not least when you then ramp the price up. This month, however, the Megazine stands true. It’s cover-to-cover goodness, although curious scheduling means it’s not great as a jumping-on issue. (The Dredd and Anderson tales are parts 3 and 4, respectively.) Whether the momentum can be maintained remains to be seen, though, and next month’s Snow/Tiger reprint is certainly a less enticing prospect than a Jock Judge Dredd collection. The Judge Dredd Megazine is available now from all the usual stockists for £4.99. More information on 2000 AD products can be found at 2000 AD online. Judge Anderson is an anomaly in the world of Judge Dredd. Moral, emotional, occasionally zany, and resolutely human, she offers a social conscience that sits in stark contrast to the head-cracking grimness of the monolithic Dredd. As befitting a sometimes screwball character, what we have here is an oddball collection. Instead of Rebellion’s usual chronological fare with major characters, Shamballa offers a kind of ‘best of’, compiling stories illustrated by definitive Anderson artist Arthur Ranson (whose artwork also graced the excellent Button Man). Although initially a foil for Judge Dredd, unnerving the square-jawed one with her flippant manner, Anderson moved in an overtly serious direction under Alan Grant, exploring the difficult subjects of child abuse and religion. The bulk of the ‘think of the children’ arcs are missing in this book, which instead largely concentrates on Anderson’s gradual understanding surrounding religion and faith—powerful ideas that the Judges seek to quash in the Godless world of Mega City One. Within this book’s pages are Anderson’s two best tales. Shamballa chronicles Anderson leading a team of scientists beneath the Himalayas to try and stop cataclysmic supernatural events that are threatening the existence of the world. And Satan pitches Anderson against an evil, ancient being that at least thinks it’s the devil. However, because this collection cherry-picks Anderson’s adventures, it’s incomplete. With a character like Judge Dredd, this might be less of a problem. But in this book, events are regularly witnessed out of context, and dialogue refers to things that you’ve not seen. A good example is lead story Shamballa: much of the emotional impact of the events resonates from the suicide of Anderson’s close friend Judge Corey. However, with the Corey story yet to see reprint, newcomers and lapsed readers will likely miss the significance of chunks of this book. Despite its flaws, Shamballa nonetheless cements itself a place amongst the best Dreddworld books in Rebellion’s line. It’s just a pity so much of the story is missing. Judge Anderson: Shamballa is available now for £15.99. For more information about 2000 AD graphic novels, check out the 2000 AD Books website. Judge Anderson patiently waited for Dredd to return with the Nurofen. In a sense, you’re becoming a director for Hellboy, rather than having your finger in every single pie. How are you dealing with going from being in control of everything to being a scriptwriter? Well, on one hand it’s great because you’re exposing Hellboy to a much wider audience—it’s the flip-side of this whole thing. More people are going to know the movie than are going to know the comic, but some of the people who see the movie will come and discover the comic. That’s one side of it—the great side. The other side is that a lot of those people are never gonna see what you do. But at least you made up something that got out to the world—that’s pretty cool. And I’m one of those guys who erases ten lines for every line they draw, so for a while there, not drawing this stuff was actually kind of a relief… But what you start to miss is getting your hands in there, into everything. The thing that I’m constantly fighting against—right now fighting a losing battle, although hopefully I’m going to win it in the next year—is that you end up spending so much time overseeing so many different things that you don’t get any time to really focus on any one thing. I’m writing Hellboy comics, co-writing a couple of other Hellboy-related things. I’ve worked on the animated films, and I was working on the live-action film. So I was spread pretty thin. I keep saying I’m gonna back off—I would love to get back to just going down every morning to the studio and writing and drawing something. But at the same time, I’ve kind of created this monster and have to keep feeding it. And if you have people saying they want the creator’s input, how can you say no? Then you’ve got no real comeback if things don’t turn out the way you want. Fortunately, everything that’s been done with Hellboy has benefited from my input, because, in every case, a lot of people have listened to what I was saying. It wasn’t just that they wanted me as a marketing tool, to say the writer endorsed the property. But that’s because I’m working with creative people that respect what I do. The alternative is that you don’t let anybody play with your toys, you don’t let anyone have your property. But there’s always that chance of what if it works? What if they make a really great film? Is it more important for you to just go for something, then, rather than perhaps regretting not doing so later? If something doesn’t turn out too well, I guess can always move on to the next thing, but without trying, you never know. Well, as soon as Hellboy was optioned for a film, the first thing I did was go home and make up another character. This character was similar enough to Hellboy that if the film was so horrendous and people hated it so much that I could never go back to something called Hellboy—kind of like after Howard the Duck came out and it was like, “Oh no, you’ve poisoned this thing forever!”—I’d have had something to fall back on. I had all these stories I wanted to do, and I needed a character where I could roll all those characters and stories over to this other character. But some mystery writer is credited with saying this thing about Hollywood where a reporter said “How do you feel that every time Hollywood makes a film out of one of your books, they ruin it?” and he replies “No, they didn’t—the books are just fine”. That’s the thing you cling to—the book’s on the shelf, and I’m looking at it right now. This is why I can’t imagine just writing a screenplay and turning it over to Hollywood, because then no-one will know what you really wrote. Once it goes through the process, chances are it’s gonna change. I mean, a buddy of mine is just going through this in animation. He spent a year creating something for animation and it stalled someplace and it’s not being made. And I said to him, why don’t you do it as a comic first? You’re an animation guy, you can draw fast. Take a couple of months, draw a graphic novel or a couple of comics, and have them published. If the animation either doesn’t work out very well or it doesn’t happen at all, at least you’ve got something out there where you can show people something you made up. But making something up and being completely at the mercy of Hollywood—either to put it in a drawer or turn it into something else—is horrifying to me. So what’s the future for Hellboy and for Mike Mignola? Theoretically, what I keep saying is that next year I’m gonna get back to drawing some of my own stuff. And what I will keep doing is writing the Hellboy comic. Hopefully, I’ll be able to step in every once in a while and do five pages, but I’ve got my own stuff right now that I want to draw, a vague idea of what I want to draw and make myself. I co-wrote and illustrated a novel [Baltimore: Or, the Steadfast Tin Soldier and the Vampire], and that worked out well, and so a couple of these other things I’ve made up along the line—things that would be a 200-page graphic-novel that I’m just not in a position to sit down and do—I like the idea of writing them up, handing them over to Christopher Golden and collaborating on more novels that I’d illustrate. And, yeah, I’d like to be able to focus my energy a little bit more and show people some new work that’s entirely by me. Hellboy has a future. I’ve plotted it out to more or less the end of the series—or what could be the end of the series. My entire goal with Hellboy is to get to do the whole story. I’m not getting any younger! If I was trying to draw this thing myself, we’d never see the end of this story! Hopefully, I can get Duncan Fegredo to stick around to the bitter end of this thing. God knows if he’ll do it, but I’m really happy with the collaboration I’m having with him on the Hellboy stuff. So, yeah, I just want to finish that story. That’ll be a somewhat rare thing to see in the world of comics: a lengthy story with a beginning, middle and end. It’s one of the problems you run into in a mainstream comic—lots of them have the illusion of change, but because all these are huge properties owned by giant companies, they’re never really gonna let you keep a Superman dead, never gonna let you cut a Batman in half and keep half of him alive. But because I own Hellboy and control Hellboy—at least the comic-book version—I can make definite changes with that character, and they’re happening right now. It’s actually very strange. After ten years of fumbling round in that Hellboy world, it’s now set on a certain course, and I’m starting to turn corners where once I’ve done that, I can’t go back. So it’s exciting—the story is going someplace. But it’s a little daunting when you go OK, we’re not going back there anymore! The weird thing will be if Del Toro does a third Hellboy film, which would probably be the end of that film cycle. He would be doing the end of Hellboy ten years before I get to the end of Hellboy. The one thing I’ve got to be real careful of is that I don’t tell him how I plan to end the comic, because I sure as hell don’t want him to put it on film! Hellboy 2 noticeably moves towards the mythology angle evident in the comics, instead of concentrating on the action and ‘Lovecraftian’ elements of the first. That was a conscious decision that Del Toro and I both made, because the one element that was not in the first film at all was the folklore and mythology stuff. There was Lovecraft-meets-pulp-magazine-mad-scientist stuff. And so we decided for the second film to do the other side of Hellboy, the folklore and mythology. If you look at the two films together, you kind of see the range of Hellboy. I was very happy to go in this direction, especially once we’d seen Pan’s Labyrinth, which I hadn’t seen when we made up the story. And maybe it would have been difficult, but when we went in and explained it to the studio—because we’re pitching a story where Hellboy fights fairies and elves, and no matter how much we tapdanced around, sooner or later someone would have to mention fairies or elves, and the other guy would have to jump in and say “It’s not what you think! It’s going to be really dark and really scary”—after Pan’s, it was a lot easier. We could say it’s kind of Hellboy meets Pan’s and everyone knew what we were talking about. And when I actually saw Pan’s, we were going through a phase where the studio that was going to do the picture wasn’t going to do the picture, and it looked like it wasn’t going to happen. So suddenly all these things that I was reading in the screenplay where I was going “this is cool, but I’ve never seen them doing anything like this,” and “I wonder what it could look like”, once I’d seen Pan’s, I was like “Oh my God—now I see the flavour of Hellboy 2”. To see Pan’s and think we’re not gonna get a chance to make Hellboy 2, that was kind of a rough evening. It’s kind of funny having to excuse your inclusion of elves and fairies. If you read the old myths, they’re dark and evil creatures. Del Toro and I understood that, but people either think of cute fairies down the bottom of the garden or they’re thinking Lord of the Rings. With elves, people think of pointy ears, and when you talk about fairies, they only know cute ones. Well, they’ll see a nasty kind of fairy in Hellboy 2! It’s just not what what the film audience is used to, and it’s certainly not a guy sitting in a studio office is used to! Hellboy also had an animation spin-off, with two DVD features. Where did the idea of that come from? Well, Del Toro had talked about an animation a lot, but I think it was Revolution Studios that set up the whole animation thing. I wasn’t the driving force behind it—I’m never the driving force behind anything other than the comic. And so when I heard they wanted to do animation, I knew that there was a Hellboy fan named Tad Stone who’d been at Disney for years, but who was now available. The first thing I said was: “Listen, if you guys are gonna do animation, hire Tad Stone, so someone up there understands the comic.” Because, clearly, Del Toro wasn’t gonna have the time to devote to the animated thing, and I didn’t have time and I’m not an animator. I knew what I’d do story-wise, but again it’s a different medium than the comic, so we needed somebody up there who knew animation, and knew the material and I that I could work with. Fortunately for me—although I think the fans feel otherwise—they also said they didn’t want it in Mignola style… That was a studio decision, which I was fine with, because if it was in my style, I’d sit there going “Oh, they don’t understand it, they’re not doing it right!” Like when I see people imitating my work, I just see the mistakes. So when they wanted a different style, I thought this was great—one more thing to distance it from the comic and make it an alternate version of Hellboy. Just like Del Toro’s Hellboy is the live-action Hellboy, the animated Hellboy is the ‘Tad Stone’ Hellboy. Both of them are really faithful to the spirit, and the animation is probably closer to the stories that I did, but they’re both their own thing. How do you personally correlate all the different versions of Hellboy, and which for you is the definitive version? For me, it’s the one that came first—the one that I do—that’s the definitive version. There are things that I got to do in the animated films that were actually cooler than what I came up with, especially in the third film that it doesn’t look like we’ll get to do, but which was written. It was kind of a retelling of Hellboy’s origin, and a fun opportunity to revisit my material and do it differently. But the way I did it in the comic is the real Hellboy. It’s my version, and my version has a beginning, a middle and an end that I hopefully will get to one of these days! What’s weird and takes a lot of getting used to now—and this is a good warning for people who are going to go into having work adapted—is that the real version, my version, is the version that the general public will be unaware of. I said to Del Toro the last time I saw him, when we were discussing our various ‘legacies’, that when I die—if anybody remembers and if Hellboy’s still a going concern—and someone says the creator of Hellboy died today, they’ll show a clip from the movie! They won’t show a panel from the comic, because that’s not what the public will know. It’s funny how many people still don’t see comics as just another storytelling medium. In the UK and USA, you get people flocking to comic-book movies—many of which are actually dumbed down—but they won’t pick up a comic book! Yeah, there’s still a prejudice against the subject matter, which is why it’s kind of funny they’re flocking to see something that they wouldn’t read, and that they think they know. Maybe with things like Spider-Man and Batman, they saw it as a kid—like the TV show or read the comics. But, you know, those things are in pop culture. What’s a much bigger struggle is selling a movie like Hellboy, a character that the audience doesn’t know. How do you make it something that more than the 25,000 people that are buying the comic want to see? How do you get beyond that audience? With thanks to Mike and Christine Mignola, and the guys at Dark Horse. The official Hellboy website can be found at hellboy.com. The Hellboy movie website is at hellboymovie.com.